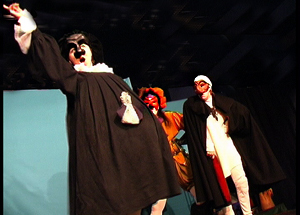 Some of the special conventions in Commedia dell’Arte are the use of entrees, sorties and sidelines. An entrée always have to be exaggerated and articulate. I don’t just have to be so full of energy that the mask entering the stage takes over the focus and raise the level of performance; it also has to present the character of the mask, emotional state and business. In the old times the actors could get extra paid for every entree applause. Sometimes I have used small trampolines behind the backdrop to help the actors get the right energy at the entrée. Every time a mask comes on the stage he bounces off from the hidden trampoline and sort of flies on to the stage. Even if the form of the sortie is important can it be highly unmotivated. From the same idea that the mask may never enter the stage if he doesn’t have anything to do there he may just unmotivated leave the stage when he has done his business. Either the mask just leaves the stage or it finds an silly or simple motivation on the spot. But still the form of the sortie and what it says is important. An aparte is just Italian for a sideline or an “aside”. In Commedia dell’Arte, with its mask technique, a mask does an aparte when it – for I short while – let’s go of the action on stage, take a step forward to the audience, and deliver a line or two, then steps back and continue as nothing has happened. Meanwhile the other masks either freezes or continue their actions quietly without carrying the plot forward. This is a way for a mask to comment on what is happening undisturbed. The actor may even chose to take of the mask in order to make his comment from another angle than what the mask is able to. Note that it is not really the same thing as in a melodrama for instance, where it is used to help the plot forward, while in Commedia dell’Arte it is more used for just a gag or a lazzo. And since Commedia dell’Arte, with its loss of the 4:th wall, as a form is in constant dialog with the audience is not needed in the same way. This entry was posted in Acting style and tagged aparte, Arlecchino, blog, blogg, Capitano, comedy, commedia, Commedia dell arte, commedia dell'Arte stage, Dottore, fixed masks, Innamorata, Innamorati, Innamorto, Klingvall, Kompani Komedi, Kulturama, mask, Micke Klingvall, Pantalone, physical theatre, Pulcinella, sidelines, sortie, stage, stage technique, tag, Teaterstudion, theatre, theatre education, theatre school, theatre student, theatre teacher, Theatrestudio, vulgar, vulgar comedy, women in comedy, women in theatre, Zanni. Bookmark the permalink.